Brisk is one of World’s 10 largest spark plug producers with a 70-year tradition of spark plug production. Brisk is a leader in spark plug technology and design, capable of custom production and turnkey projects. Brisk manufacturers a vide variety of spark plugs, some with unique and superior characteristics. A key requirement of O.E. spark plugs is long life and low price. 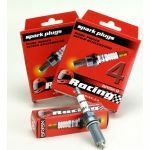 On the other hand, key features of Premium spark plugs is maximum efficiency and durability fora specific application.